The alternator is an essential component in the electrical system of any GM car manufactured from 1963 through 1982 including the Corvette, since it picks up the tab on the DC voltage and keeps the battery charged. Like all things mechanical, eventually it wears out and fails. Such was the case with the alternator on my '67 Big Block Coupe, which had an incorrect chrome-plated alternator in it. The procedures I detail here are the same for small or big block GM engines from 1963 through 1982. Here's what's involved in doing a replacement of this component. 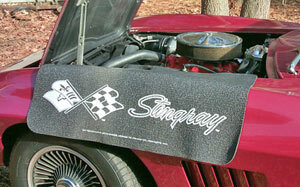 I always use and recommend using a fender apron whenever you have to do any work under the hood of your classic car. This particular apron is a "Fender Gripper" from Snake-Oyl Products and has a cushioned non-slip backing. It does a great job of protecting the original (survivor!) nitrocellulose laquer paint on my Mid-Year from belt-buckle scratches and doubles as a mat for resting tools on, too. The first thing you should do is disconnect the positive lead from the battery. 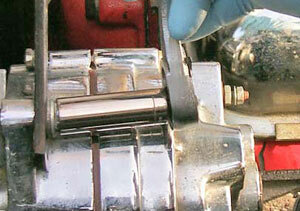 You can get a nasty shock when removing the old alternator if you don't take this precaution first. Use a nut driver or socket to remove the 5/16" nut that secures the black ground wire to the alternator, and pull the wire free of its stud. 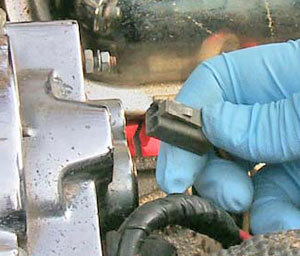 The harness plug is removed next by depressing its clip and pulling it out. The rubber boot on the red positive lead can then be pulled back and the 7/16" retaining nut taken off so the lead can be removed from the alternator. This completes the electrical disconnections. A 1/2" bolt secures the top of the alternator to the upper mounting bracket, and this bolt is the next item to be removed. The bracket can then be swung up and out of the way at this point. 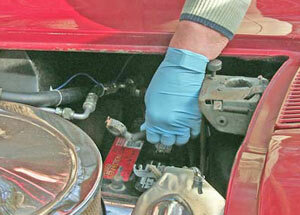 Push the alternator toward the engine to gain some slack in the belt, then slip the belt over and off the pulley. Pull the alternator toward the inner fender as far as it will go so you can gain easier access to the lower mounting bolt. 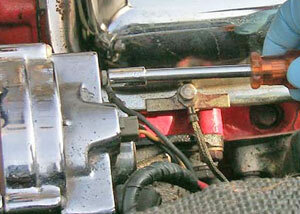 Use a 9/16" socket with an extension to remove the nut and lock washer from the bolt. 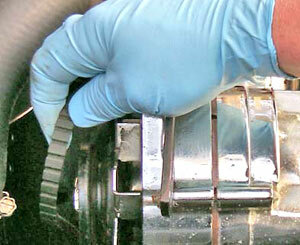 Once the nut is removed, the bolt can be removed from the lower mounting bracket. You may have to give it a gentle tap, but it should pull free without too much trouble. 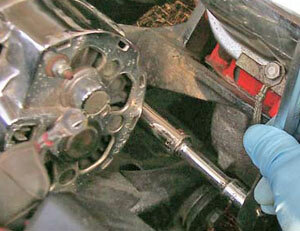 With this done, remove the old alternator from the vehicle. 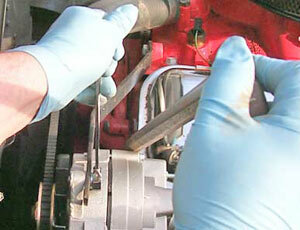 Installing the new alternator is a reversal of the steps used to remove the old one. Start by positioning the alternator in the lower mounting bracket, then insert the bolt and snug-up the nut with lock washer. Slip the belt over the pulley and insert 1/2" bolt through the upper mounting bracket and thread it into the alternator. 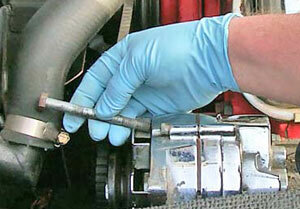 Use a prybar to put tension on the belt by pulling the alternator toward you while you tighten the upper mounting bolt. Tighten the nut on the lower mounting bolt, reconnect the positive lead, the harness plug and the ground lead. Then reconnect the positive battery lead and start the car up. 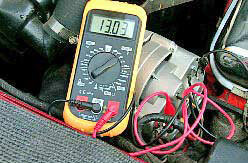 Connect the positive and common leads of a multimeter to the corresponding terminals on the alternator, select the 20-volt range and see what kind of voltage the new alternator is putting out; it should be between 12.3 and 14 volts if it's working correctly. When it checks out OK, shut the engine off, disconnect the multimeter and slip the rubber boot over the positive terminal on the alternator. Job Completed!